Everything you need to know about Holley LS Fest 2018! Holley’s eighth annual LS Fest kicks off September 7-9, 2018 at Beech Bend Raceway in Bowling Green, Kentucky. The event is centered around GM’s popular LS engine, and welcomes any and all vehicles equipped with an LS engine (or late model LT V8), whether originally installed or installed as a modification to an existing vehicle. The event has grown each year and now brings over 25,000 LS gearheads, participants, and spectators together for the performance filled three-day event! September 7, 8, 9, 2018. LS Fest has historically been held the weekend after Labor Day since the inaugural year. For those who wish to participate with their vehicle, we have several packages available: Grand Champion Pack grants you access to the autocross, 3S Challenge, Dyno challenge, Countryside Cruise, Track X, and the Grand Champion specific Drag Class. This class is limited to the first 200 registrants and includes gate passes for the competitor and three others. For those who do not want to participate in the Grand Champion competition, we also have a 3-day Autocross package. This allows you to run your vehicle in the autocross, dyno challenge, 3S Challenge, Track X, Countryside Cruise, and the appropriate Show-N-Shine class for your vehicle. For our drag racing contingent, we have nine drag racing classes from which to choose. Please follow the link to find out more about class information. A drag race package allows a racer to participate in the Dyno Challenge, Friday Test-N-Tune, and Saturday and Sunday drag racing. If you’re not into putting your pride and joy through the ringer, we also have a 3-day car show pack available. This package is great as it includes gate passes for two people, and allows you to participate in the appropriate show-n-shine class for your vehicle, the countryside cruise, and the dyno challenge. We also have a bonafide road course challenge taking place at LS Fest. This portion of the event will be taking place at the NCM Motorsports Park on Friday and Saturday. This class is limited to the first 75 vehicles. All registration/check in located at Beech Bend Amusement Park Pavilion. Friday, Sept. 7: 8:00 a.m.-8:30 p.m.
Saturday, Sept. 8: 8:00 a.m. to 8:30 p.m.
Sunday, Sept. 9: 8:00 a.m. to 4:00 p.m.
Click to view the current LS Fest Event Schedule. Each LS Fest Registration package includes entry for the vehicle and driver, including Grand Champion. Remaining packages comes with two gate passes. Children sixteen and under are free. A goodie bag stuffed with cool giveaway items and freebies from Holley, our sponsors, and midway vendors is available for any registered participant! Any additional adult passengers outside of the allotted passes for each registration will be required to purchase a spectator ticket upon entry. Please bring your event confirmation, valid driver’s license, proof of insurance, and the vehicle’s valid government issued registration with you to Beech Bend Amusement Park Pavilion. IMPORTANT Note: Only the listed registrant may pick up the credentials. We have included a map below to help you locate this area. For the entire event registration/check in for ALL participants will be at Beech Bend Amusement Park Riverbend Pavilion. ALL registered and non-registered participants MUST come to this location PRIOR to entering the Beech Bend Raceway park. WATCH FOR SIGNS! All pre-registration credential pick-up will be at Beech Bend (no off-site pickup is provided). We will be using Beech Bend’s Amusement Park Riverbend Pavilion. All participants must stop at registration and pick up credentials. You do not need to produce the confirmation letter at registration, but you will have to have your valid driver’s license, proof of insurance, and the vehicle’s valid government issued registration. Important note: Only the listed registrant may pick up the credentials. Can I camp at Beech Bend over the weekend? Yes, Beech Bend has onsite campgrounds available – please see this link for information: https://www.beechbend.com/schedule&rates.htm Please note that slots are first-come, first serve. Tent camping will NOT be allowed on the race track property during Holley LS Fest, however, if you are bringing your RV/Camper and are a registered participant, you are welcome to camp in that vehicle within the property during the event. Rental carts are not available for spectator rental at LS Fest. 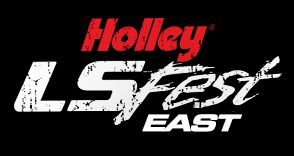 However, support vehicles, including golf carts and ATVs, that support officially registered Holley LS Fest participants will be allowed at Beech Bend Raceway Park, and must display the official and current Holley LS Fest support vehicle permit decal. The permit decal must be applied to the vehicle in such a manner that it is clearly visible and unable to be removed and shared with another vehicle. Officially registered participants who request a permit will be issued one vehicle permit for the duration of the event. All support vehicle drivers must be at least 16 years old and have a current state issued driver’s license. No pets are allowed in the Beech Bend Raceway facilities. Still Have Questions? Please email lsfest@holley.com and we will get back to you. We are looking forward to seeing you in Bowling Green!